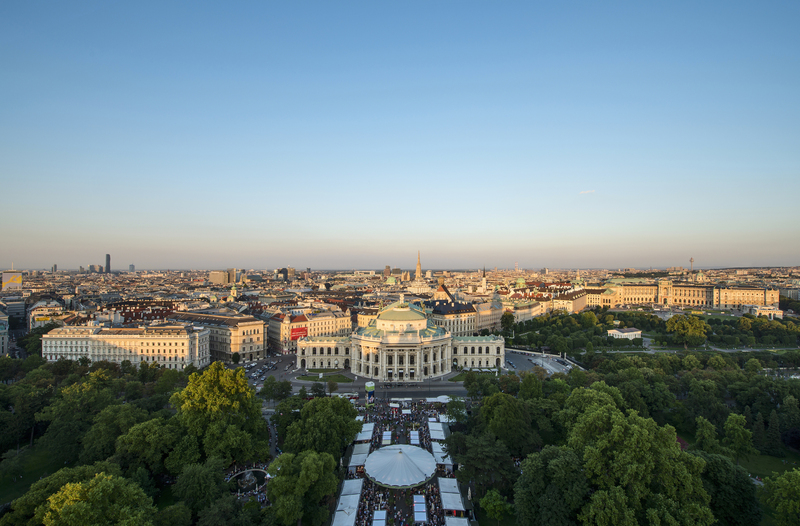 Vienna’s Ringstrasse celebrates its 150th anniversary by hosting events throughout 2015. From military grounds to showpiece boulevard: Vienna’s Ringstrasse celebrates the 150th anniversary of its opening in 2015. The largest construction project in Vienna’s history marked the capital’s transformation from an imperial capital to a truly European metropolis. Throughout the year the Ringstrasse provides the backdrop for a diverse range of large-scale events that play out in the buildings lining the boulevard and its squares and parks. Cultural highlights include the world-famous New Year’s Concert by the Vienna Philharmonic Orchestra at the Musikverein, the Music Film Festival on Rathausplatz in summer and live opera broadcasts on the big screen outside the Vienna State Opera (Oper live am Platz, April, June, September and October). The focus turns to sport at the Argus Bike Festival cycle show in April, and the Vienna City Marathon which finishes on Heldenplatz. In September Vienna hosts the biggest prize in equestrian sport when the Global Champions Tour comes to Rathausplatz for the Vienna Masters. The square also sets the stage for Vienna Ice World from January to March when it is transformed into an ice skater’s paradise. Culinary specialties from local growers and producers are the order of the day at the Genussfestival in Stadtpark in May, while Modepalast at the MAK Austrian Museum of Applied Arts/Contemporary Art showcases the latest fashions and fashion-related products. At the same location, the Blickfang sales fair puts the spotlight on design every October. From mid-November onwards Christmas and Advent markets start to spring up at locations throughout the city, including Rathausplatz, Karlsplatz and Maria-Theresien-Platz, the square between the Natural History Museum and the Kunsthistorisches Museum. The historic buildings lining the ‘Ring’ also host countless balls, mainly during the season in January and February. Venues include the Hofburg Palace (Hofburg Silvesterball, Coffeehouse Owners’ Ball, Hunters’ Ball and others), Vienna State Opera (Opera Ball), Musikverein (Vienna Philharmonic Ball), Konzerthaus(Bonbon Ball, Costume Ball) and City Hall (Vienna Science Ball, Flower Ball, Concordia Ball, Vienna Red Cross Ball). Europe’s largest Aids charity event, the Life Ball, brings revelers to City Hall in their droves. The spectacle gets underway with a free fashion show on Rathausplatz. In June the gay and lesbian community gets together for the Rainbow Parade and Vienna Pride on the Ring. The partying continues in August with the Streetparade and the Streetfestival on Rathausplatz. In recent years a lively bar and restaurant scene that hits fever pitch in the summer months has taken up residence on the stretch of the Danube Canal by Franz-Josefs-Kai. This section of road between the Ringturm tower and the Urania Observatory marks the start and finish of the Ring encircling the historic city center.